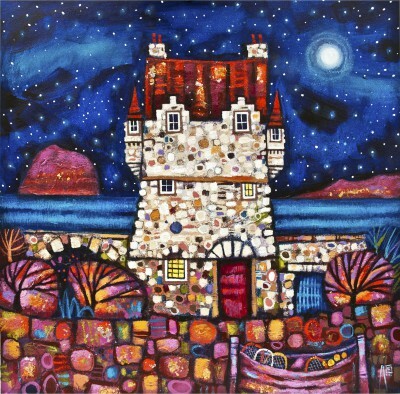 Right now we are waiting for new Ritchie COLLINS Naive Art to arrive at the gallery. In the meantime, here is a wider selection of the artist's work featured at the Red Rag Modern Gallery. Ritchie Collins was born in Prestwick, on the West Coast of Scotland in 1978. 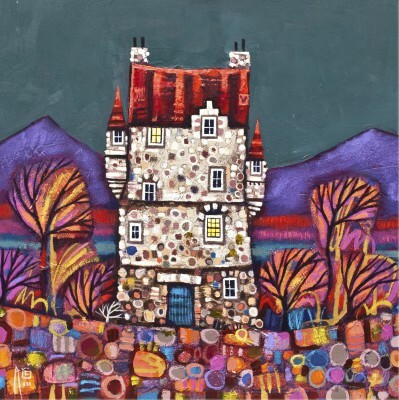 He has painted all his life and studied painting and illustration at the College of Building and Printing, Glasgow before settling in Edinburgh. 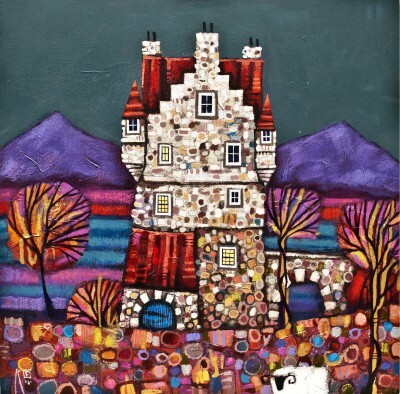 Ritchie Collins art is influenced by the Scottish coast and wild countryside. Celtic art, myths and Scottish folklore are a constant source of inspiration. Vibrant colour simple form and a creative use of texture are woven together to give the original paintings their unique magical quality. Speaking about his paintings Richie Collins says: "All the things I paint come from dreams or memories of places I've been. What is important to me is trying to capture the true feelings of a place in time, rather than the reality." Each painting tells a story and contains endless details and something new to explore with every glance. Ritchie Collins' paintings have wide appeal and there is an understandable growing demand for his art works. In addition to Red Rag Gallery his paintings have been exhibited in the UK and Internationally. Collins work is now in many private art collections. All the paintings promoted by Red Rag Modern Art Gallery have been sourced from the best of todays living contemporary artists. Each painting at Red Rag has been acquired from Modern art studio of each featured artist. You can therefore be assured that all paintings from Red Rag Modern Art Gallery are art works from the artist. Red Rag Modern Art Gallery is open seven days a week for sales of Modern Art. All wildlife Modern art from Red Rag can be delivered throughout the world service normally within a few days of purchase. To view the Naive style Modern art work of each artist simply click on the artist's name or image. Information about every contemporary painting including size and price is displayed by clicking on the image for each Modern art work.